Of the many hundreds of Aztec featherworks that once existed only a few have survived. Just like jade, turquoise and gold, featherworks were valued highly by the Aztecs and other Mesoamerican peoples. 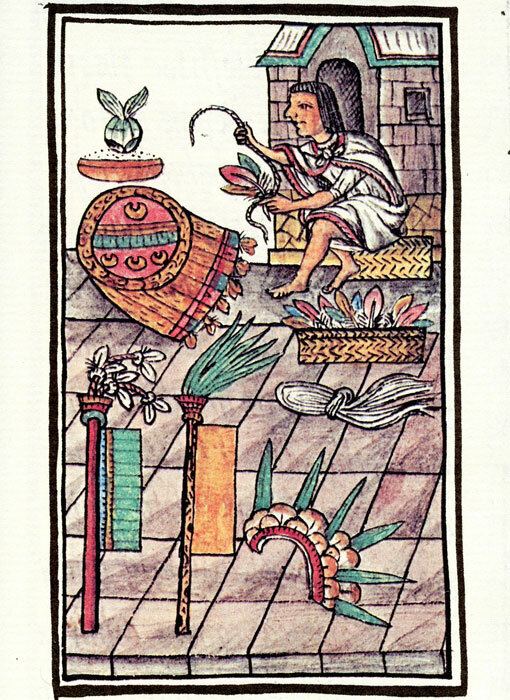 The featherworkers or amantecas were organized in guilds and stood at the service of the elite in the main centres of the Triple Alliance or Aztec Empire. 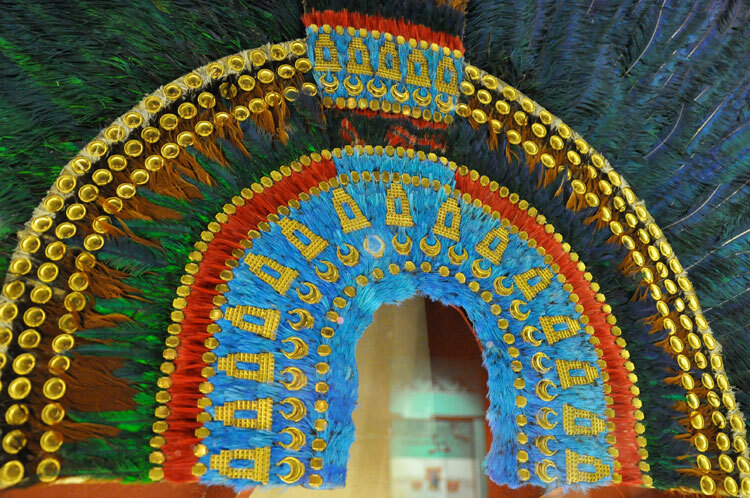 The colourful tropical feathers were imported by merchants or extracted as tribute from conquered areas since none of the tropical birds actually lived in the homeland of the Aztecs or Mexica. 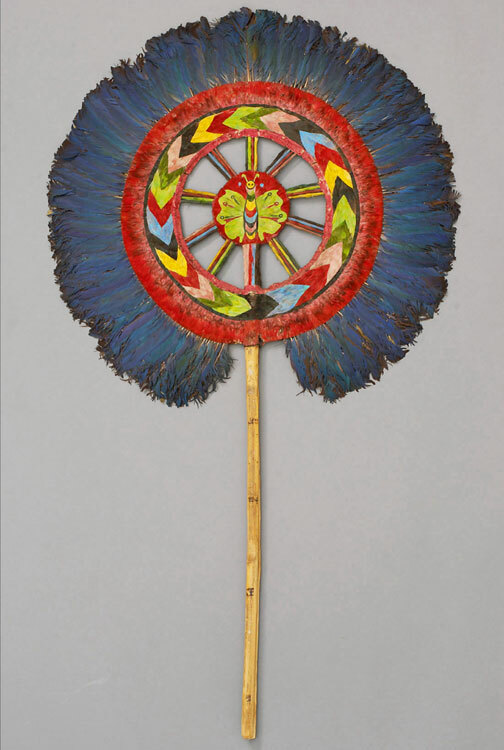 After the Conquest many featherworks were shipped to Europe and entered the collections of the clergy and nobility. These collections were the so-called Kunstkammer or chambers of curiosities. Provenances of the featherworks as well as of other objects were often forgotten or simply not (correctly) registered, e.g. 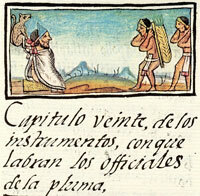 a Brazilian axe in Vienna was once attributed to “Montezuma II, Inca of Mexico”. Featherworks were registered as being “Moorish”, a term used from mediaeval times to refer to the peoples of Africa, India, the Americas, Turkey and, of course, the conquerors of the Iberian Peninsula. “Moorish”, therefore, can be interpreted as meaning: non-European or exotic, from a European point of view. However, when in the context of the Mexican featherworks, “Moorish” probably did specifically mean “Mexican”. These artefacts were indeed exotic and, therefore, curiosities. The history of the Viennese featherworks, documented in different inventories, illustrates the thoughts people had about the function and the places of origin of these artefacts. 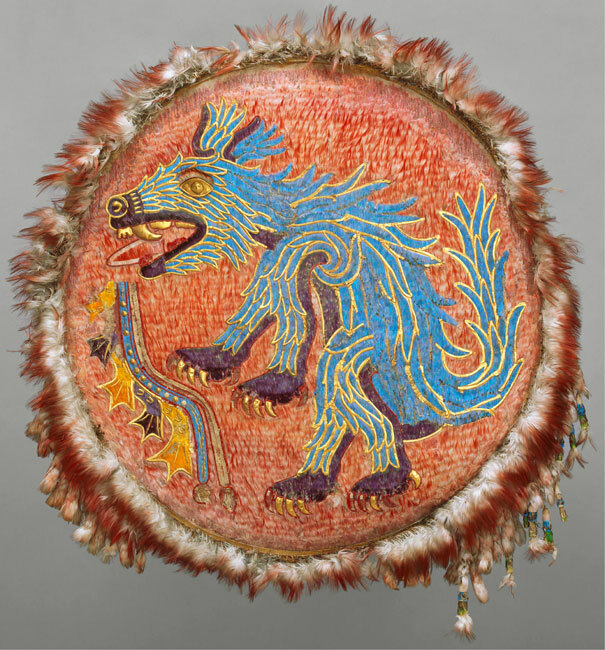 The Museum of Ethnology (Museum für Völkerkunde) in Vienna takes care of three featherworks traditionally closely associated with the Aztecs: a headdress, a fan and a shield. Especially the headdress attracted a lot of attention and has been published in many books and articles about Aztec culture. This is certainly due to its uniqueness, but also to a myth, that shows a remarkable perpetuity. This legend links the headdress to the Aztec tlatoani Moctezuma Xocoyotzin, also known as Moctezuma II, the ruler who encountered the Spanish conquistador Hernán Cortés in 1519. The story diverges along two different lines. The headdress was either among the so-called “presents of Moctezuma to Cortés” or it was taken by the Spaniards, after which Cortés sent it to his sovereign Charles I of Spain. As Charles V, this ruler was also Emperor Elect of the Holy Roman Empire and the head of the House of Habsburg, a dynasty that had its seat in Austria. After receiving the headdress, Charles supposedly passed it on to relatives in Austria, around 1524. 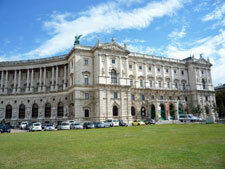 This was allegedly the way the headdress arrived in Vienna. Over time the headdress mutated into a crown, i.e. Moctezuma’s crown. None of these statements or storylines can be proven, and they, therefore, belong to folklore. Entertaining as the stories perhaps are, repeating them does not make them true. Despite research providing different insights, aspects of the stories above have been repeatedly published as either being the truth or possibly being correct, not just in popular narratives and news reports, but also in scientific publications. 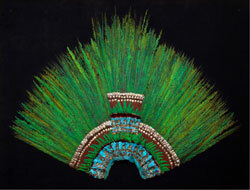 The headdress was the first of the Mexican featherworks to be rediscovered in Austria. 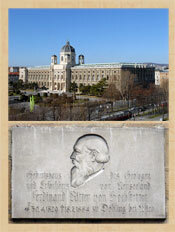 After his appointment as first director of the Imperial and Royal Court Museum of Natural History in Vienna in 1876, Ferdinand von Hochstetter, also curator of the museum’s Anthropological-Ethnographical Department, searched for ethnographical artefacts among different collections in Vienna. These were to be transferred to the museum. In a catalogue of the famous Ambras Collection, Hochstetter noticed a “Mexican head ornament”. 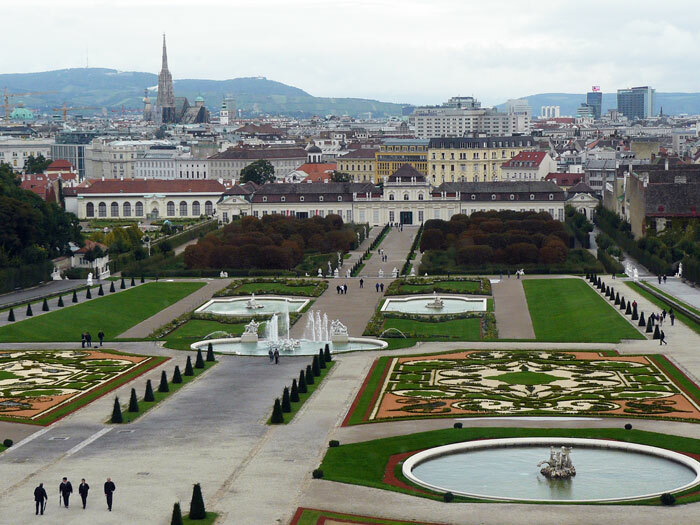 Visiting the Belvedere Castle in Vienna, where part of this collection was then stored, he found the headdress in a case. It was folded up and damaged by moths. It consists of over 450 tail feathers of the Resplendent Quetzal, as well as feathers of the Lovely Cotinga, Roseate Spoonbill, Squirrel Cuckoo and additional shorter feathers of the Quetzal. They are mounted on a net of vegetal fibres and wooden sticks. The front part is decorated with gold ornaments. In its original state, a golden bird’s beak was attached to the headdress. Upon its discovery the headdress was restored, feathers and metal ornaments (now of gilded bronze) were substituted. The approximate measurements of the feathered piece are 116 cm in height and a width of 175 cm. 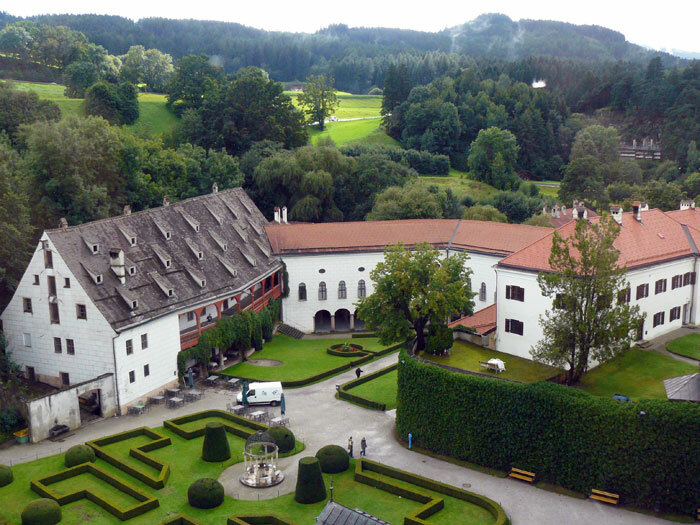 The Ambras Collection, mentioned above, was the personal collection of Archduke Ferdinand II of Tyrol (1529-1595), which he assembled first in Prague, then in Innsbruck and finally at the castle of Ambras. The Archduke was the son of yet another Ferdinand, younger brother and successor of Charles V. Due to the Napoleonic wars, a majority of the Ambras collection was transferred for safe-keeping to Vienna. In 1596, a year after the archduke’s demise, an inventory of his estate was compiled. In it (pic 9), the headdress was called a “Moorish hat”. The Spanish conquest of the Americas – the Conquista – was imaginary compared to the Reconquista of the Iberian Peninsula from the Moors, i.e. people with a dark skin. By referring to the newly conquered territories as New Spain (Mexico) and to the dark-skinned Indians as Moors, the label “Moorish hat” was probably chosen on purpose and did specifically mean “Mexican headdress”. The provenance listed in the inventories was changed from “Moorish” into ”Indian” and eventually to ”Mexican” in 1855. 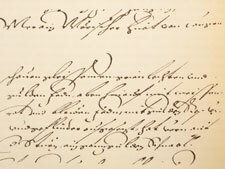 The golden beak was not mentioned any more after the inventory of 1730. 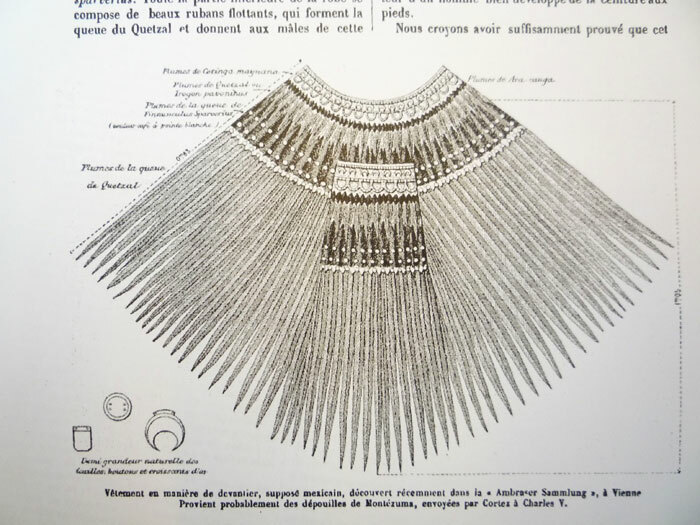 In subsequent inventories, compiled over the centuries, the headdress designation was changed into an apron, later to be reversed again into a head ornament. 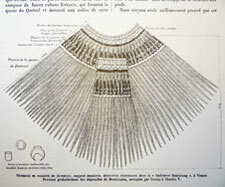 After its discovery, different opinions about the function of the headdress were presented. Not everybody agreed to it being headgear. Teobert Maler, a photographer of archaeological sites in Mexico and Guatemala thought it to be a mantle. Hochstetter himself considered the object to be a standard, similar to those worn by Aztecs of high military rank. Returning to the assumption, that the headdress was once part of the famous presents of Moctezuma II to Cortés, the aforementioned golden beak provides a clue. Although one of the Spaniards’ main reasons for conquering the Aztec provinces was, of course, the conversion of the population to Catholicism, their interest in gold was somewhat more than just a matter of secondary importance. Each of the artefacts sent to Europe was written down on official ship lists, and the gold was weighed meticulously. A headdress, such as the one under consideration here, with a golden bird’s beak attached, is not mentioned on the list of 1519, nor was such a beak of gold weighed separately. Archduke Ferdinand II of Tyrol possibly acquired the headdress from a different source. 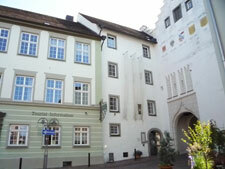 In 1574 count Ulrich of Montfort, who assembled a Kunstkammer collection at Tettnang in Upper Suebia, passed away. In an inventory of his estate “a variety of Moorish equipment of featherwork” is mentioned. Archduke Ferdinand set his mind to purchase this collection and was finally able to buy part of it in 1590. Six years later, a feathered headdress, also with the designation “Moorish”, was mentioned in the inventory of the Ambras estate, together with two other Moorish pieces now lost. These may well have come from the collection of the House of Montfort, not necessarily the private collection of count Ulrich himself, since different members of the House of Montfort laid claim to the collection after his death, indicating it was not his personal property. If the headdress did indeed come from the Kunstkammer of the House of Montfort, it is unknown how it got there. 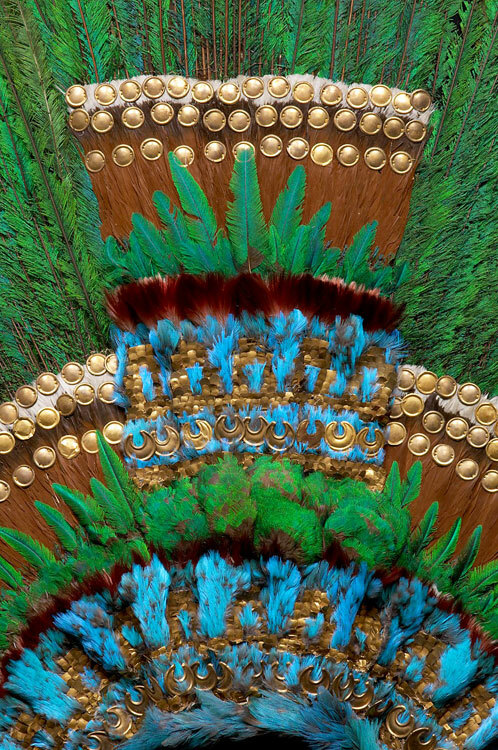 Frequently the feathered headdress is called a “feather crown” or even “Moctezuma’s crown”. 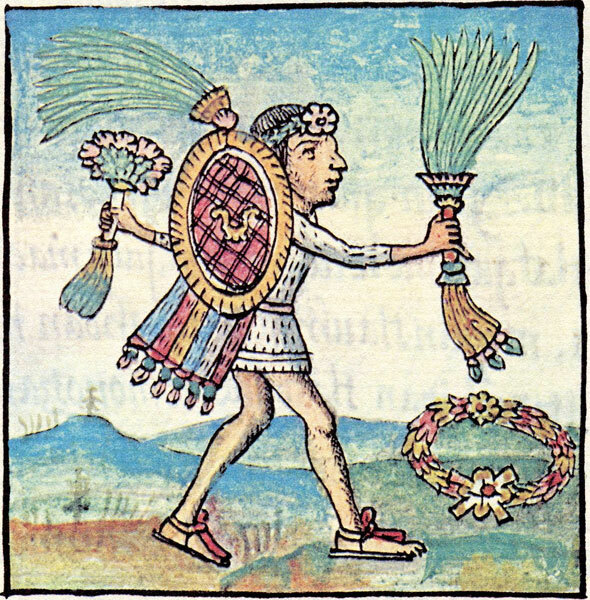 To contradict the idea of the feathered headdress being a crown and part of the Aztec’s state regalia, it is often stated that Aztec tlatoanis did not wear feathered headdresses. This is only partly correct. 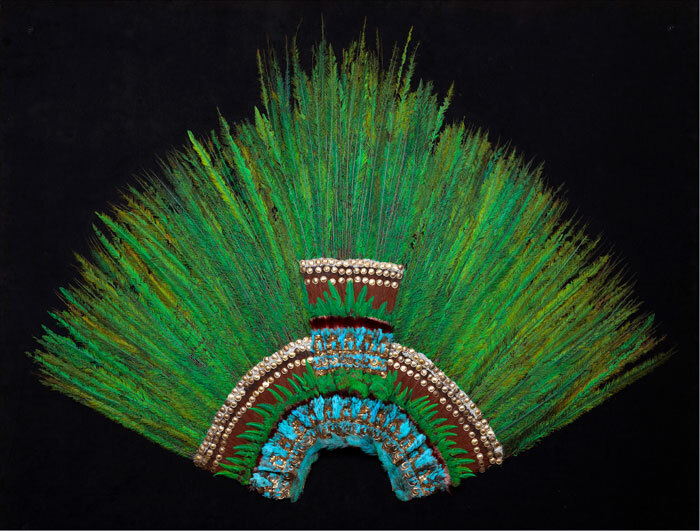 During the enthronement or official investiture, the xiuhuitzolli, a pointed diadem of turquoise and the official crown royal, was put on the heads of Aztec rulers. 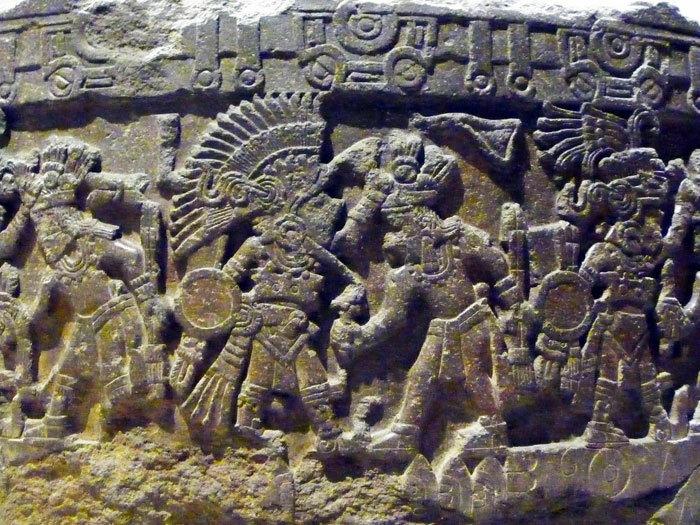 Yet, claiming they never wore feathered headdresses is ignoring the images the Aztecs themselves left behind. On the famous Stone of Tizoc, this tlatoani wears a feathered headdress, although a different one to the piece under consideration here. Moctezuma’s official portrait on Chapultepec Hill showed him with yet another headdress. This indicates that Aztec rulers did wear feathered headgear on special occasions, as did priests on ceremonial occasions. Neither is it known if the Viennese headdress was ever officially worn, nor, be that the case, by whom. In the middle of the 20th century a replica of the headdress was made. It is on exhibit in the National Museum of Anthropology in Mexico City. Interestingly enough, this 20th century copy is also very often called Moctezuma’s Crown or the feathered headdress – penacho – of Moctezuma. The replica was actually on exhibit in the exhibition Moctezuma II. Tiempo y destino de un gobernante in Mexico City in 2010, a show organized originally by the British Museum in 2009. The feather fan is also mentioned in the 1596 inventory of Ambras castle. However, at present, it is impossible to trace its earlier whereabouts. The design shows European influences, making the piece a colonial item. It consists of reed splints and a ring of probably dyed feathers, glued to agave paper. Parrot feathers are attached to the edge of the ring. The height of the fan is 119 cm and the diameter 65 cm. As with the headdress, different designations of the fan can be found in the various Ambras inventories. In earlier times it was called a windmaker, later a sun shade and after 1818 a fan. The provenance remained insecure, originally thought to be “Indian”, this was later changed into “Mexican” with a question mark. 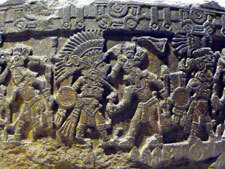 Just like the standards of Aztec military officers, fans were also signs of rank or office, e.g. of messengers, ambassadors and merchants, apart from being used in festivities for the gods. 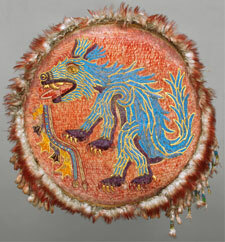 The featherwork shield was found in the castle of Ambras in the late 19th century. The old inventories always listed it as a shield, apart from the 1788 inventory which describes it as a sun shade. This was also the year, when the first provenance was mentioned: “Chinese”, later to be changed into “Indian” and “Ancient Mexican” in 1882. 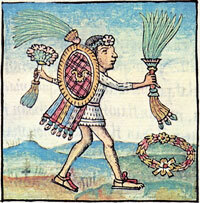 The shield has a framework of reed splints, wood and leather, covered with agave paper to which the mosaic, consisting of feathers and sheet gold, is glued. 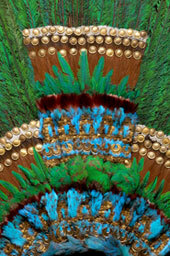 Feathers are attached to the edge of the shield with several tassels of feathers hanging from the lower edge. The feathers came from the Scarlet Macaw, Roseate Spoonbill, Lovely Cotinga, Resplendent Quetzal and the White-fronted Parrot. The shield has a diameter of 70 cm. The image shows an animal with canine features. 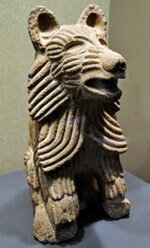 The glyph atl-tlachinolli (water, fire), an emblem for war, appears from its mouth. Another Aztec figure of speech for war, in mitl in chimalli (the arrows, the shields), actually uses shields to refer to warfare. The identity of the figure, of course, has been a topic of discussion. In the Ambras inventories it was listed as a blue dragon or a monster. 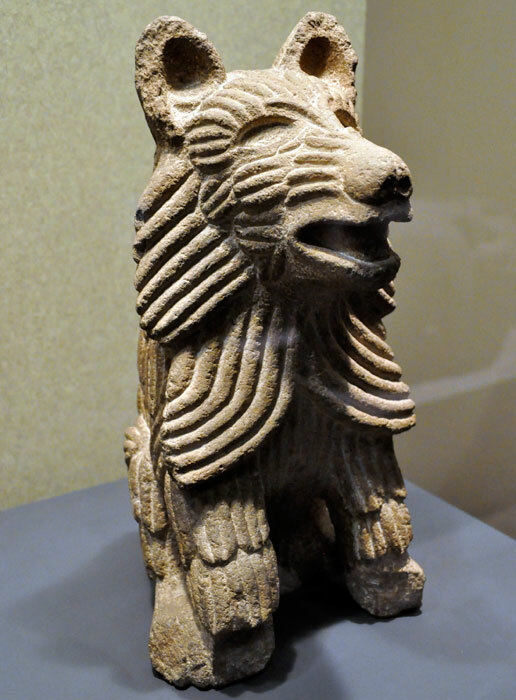 Apart from an incidental suggestion that the animal represents a wolf or even a bear, an idea hard to combine with the long tail, it has usually been interpreted as either being a coyote or an ahuitzotl, a mythical aquatic being. 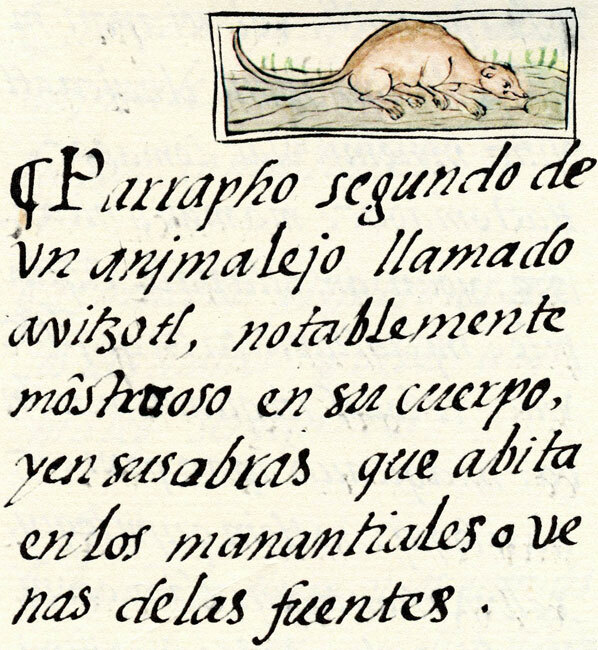 In the Florentine Codex of Fray Bernardino de Sahagún, the ahuitzotl is a dangerous, mythical water animal. It is described as being dog-like, long-tailed, it has short ears and a slippery, rubber-like body. 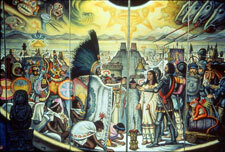 This is indeed the way the ahuitzotl is represented in Aztec art. 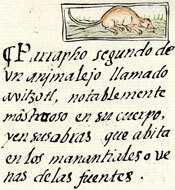 The skin of the animal on the shield, however, is feathered or “hairy”, making a designation as an ahuitzotl rather implausible. Among the Aztecs, the coyote was one of the animals associated with war. Qualified Aztec warriors were given the right to wear a coyote costume. An interpretation as coyote for the figure on the shield seems to be a reasonable possibility. Besides, the Aztec featherworkers, the amantecas, did revere a coyote god. The fact that the ahuitzotl interpretation for the shield is still being presented as an option, may have another reason. 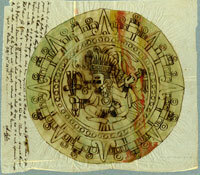 This identification presents the possibility of connecting the shield to the Aztec ruler Ahuitzotl, the predecessor of Moctezuma II. Needless to say, the shield has also been attributed to the last ruler as well. Although actual proof is missing, both headdress and shield are thus, in a way, uprated or upgraded by connecting them to Aztec rulers. This is a tendency that has existed ever since the times these artefacts became known. Although there were reasons or aspirations to consider this in the 19th and early 20th century, known historical documents do not link these featherworks to specific Aztec rulers. Feathered headdresses, fans and shields were exported in quantities to Europe, most of which have disappeared. 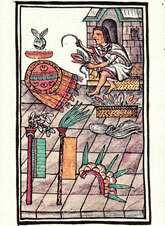 Whilst the quality of the Viennese works certifies the complexity of the applied arts in ancient Mesoamerica, their uniqueness does not necessarily make them the unique property of distinctive historical personalities. • Anders, Ferdinand and Peter Kann. 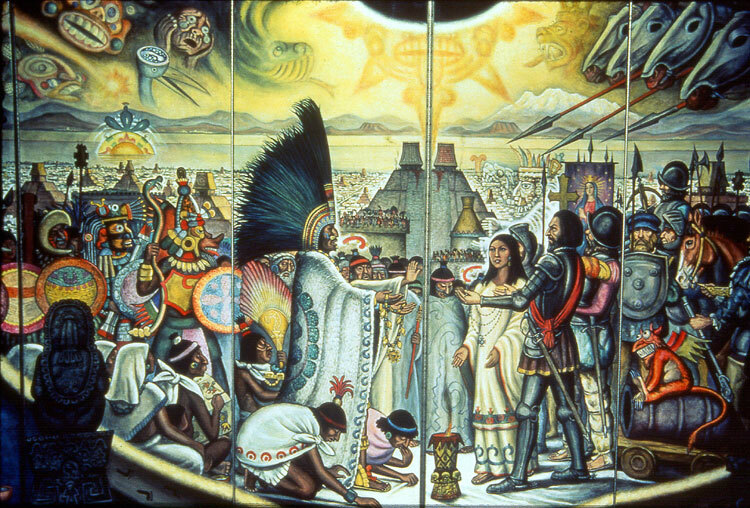 Die Schätze des Montezuma. Utopie und Wirklichkeit. Museum für Völkerkunde. 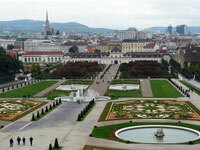 Wien, 1996. • Feest, Christian F. “Vienna’s Mexican Treasures. Aztec, Mixtec, and Tarascan Works from the 16th Century Austrian Collections”, in: Archiv für Völkerkunde, Bd. 44. 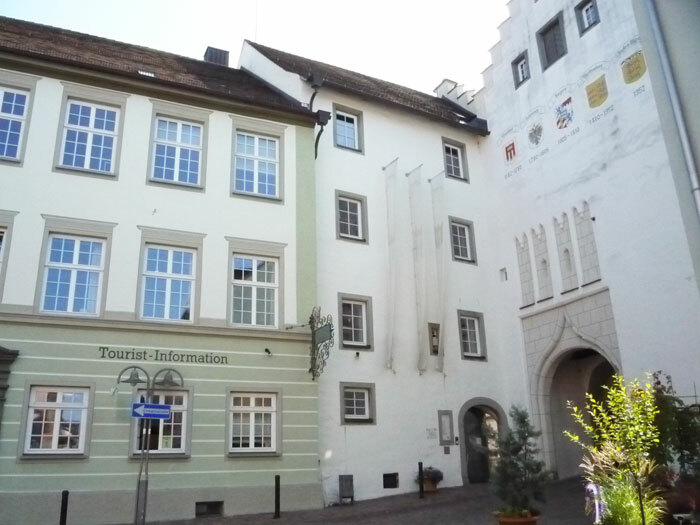 Verein “Freunde der Völkerkunde” und Museum für Völkerkunde. Wien, 1990. • Hochstetter, Ferdinand von. 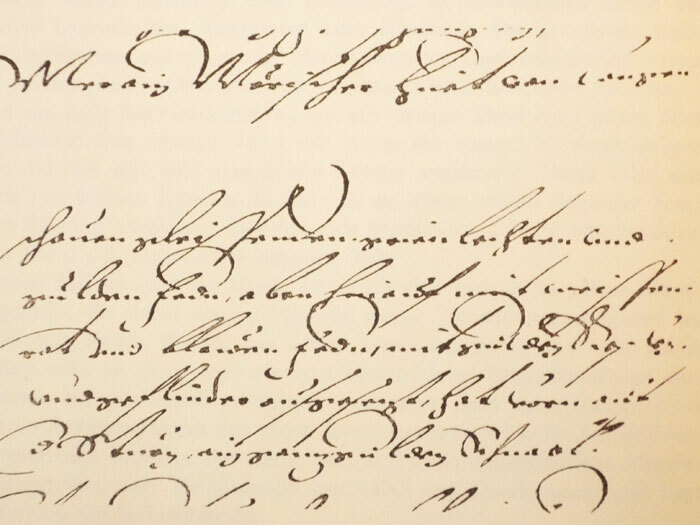 “Ueber mexikanische Reliquien aus der Zeit Montezuma’s in der k. k. Ambraser Sammlung“, in: Denkschriften der philosophisch-historischen Klasse der kaiserlichen Akademie der Wissenschaften, 35. Wien, 1884: Carl Gerold’s Sohn. • Maler, Teobert. “Un Vêtement Royal de l’Ancien Méxique“, in: La Nature, Septième année, premier semester, No. 300. Paris, 1879 : Masson. 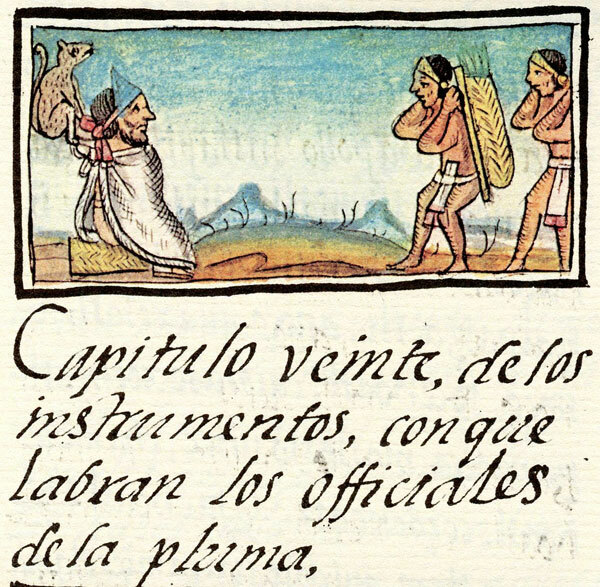 • Matos Moctezuma, Eduardo and Felipe Solís Olguín, eds. Aztecs. The Royal Academy of Arts. London, 2002: Thames & Hudson. • McEwan, Colin and Leonardo López Luján, eds. Moctezuma. Aztec Ruler. The British Museum Press. London, 2009. • Nowotny, Karl A. Mexikanische Kostbarkeiten aus Kunstkammern der Renaissance. Museum für Völkerkunde. Wien, 1960: Friedrich Jasper. • Nuttall, Zelia. “Das prachtstück altmerxikanischer Federmosaikarbeiten aus der Zeit Montezumas im Wiener Museum”, in: Abhandlungen und Berichte des K. Zoologischen and Anthropologisch-Ethnographischen Museum zu Dresden, 7, 1886/87. Dresden. 1887: R. Friedländer und Sohn. • Pasztory, Esther. Aztec Art. New York, 1983: Harry N. Abrams, Inc.
December 2012: ‘the headdress is now restored’! I am an intern at the California African Museum, and I create lesson plans to put online. Currently, I am working on a lesson on fans, and I would like to receive permission to use the photo of the feather fan for educational purposes. Please email me at CIntern1@caamuseum.org. Thank you! When was this article written? I would like to cite it in a paper I am writing. The headress is a beautiful copili. In todays dance we see the woman wearing it, during the invasion of mexico, when the male warriors fell in battle the woman rose to arms. They put on the headresses of fallen guerreros and continued to resist. Thats fierce. The headdress belongs to the country of Mexico and the descendants of these people--lets not pay homage to the theft...so sad for mankind if Vienna doesn’t give it back. What an intriguing story! 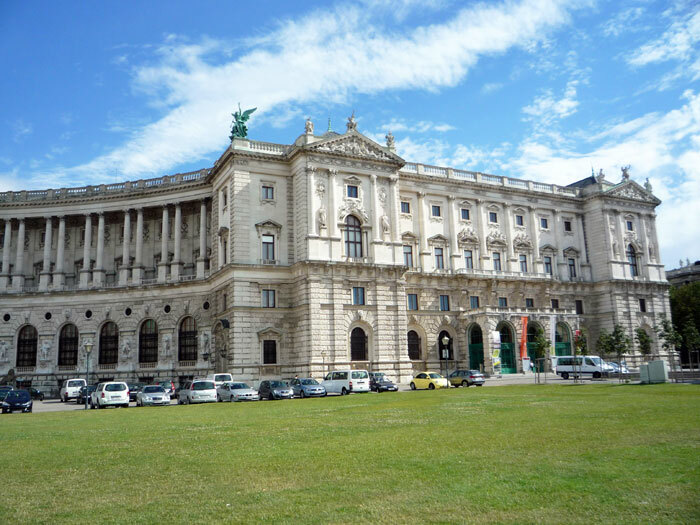 I was actually visiting the beautiful city of Vienna recently, and (being an Aztec aficionado) I visited the Museum of Ethnology to see the famous headdress. However, this item was not on display at the time. That was disappointing... The museum’s curators should put it on display since it is such an unusual item.